Technology has always played a very important role in education. The digital revolution has made this connection more vital than ever. Online learning courses and resources are becoming more and more ubiquitous, meaning that it’s becoming second nature for students to seek to access them before even considering more traditional options. As a result of this, most language schools have at least considered the possibility of taking their language courses online. Doing this can be an excellent way to tap into the financial and growth opportunities of the digital world. The idea of launching and administrating a cloud based language course can be daunting, especially for language schools who have previously dealt completely in face to face courses. Luckily, there are a wide range of online educational platforms available that make the process rather easier to handle. If your language school is seeking to invest in a learning management system (LMS) or learning content management system (LCMS), you may find that the only stumbling block is choosing which of the many online educational platforms on the market is right for you. Here is our guidance on how to recognise the best online educational platforms for teaching languages. Why are online educational platforms a vital part of the language learning process? Administrating online learning courses and resources can be a big job. This is especially true when you have a large number of students to work with and if your school is running multiple courses concurrently. Trying to handle all of these online learning courses and resources without learning management system (LMS) or learning content management system (LCMS) software is likely to be tricky. Online educational platforms create a central hub from which to host all your online learning courses and resources. It’s great for administrators as it means they can manage scheduling, enrolment, staffing and attendance all from one central spot. It’s great for tutors and trainers as they can create course content, host resources, manage assessment, communicate with students, track progress and even deliver live virtual classes all through the same piece of software. It’s great for students as they can access all course resources, work through study materials, communicate with staff and their peers, attend live virtual classes, take assessments and access revision materials all from one familiar virtual learning environment. Even better, the cloud based nature of online educational platforms means that users, be they administrators, staff members or students, won’t have to install the software on their own devices. They will also be able to access it remotely on their own computers, laptops, tablets or smartphones wherever they are; whether they are sitting in the language school classroom, at home in the next town over, or even on the other side of the world. What should you look for in online training software? It’s important to note here that not all educational platforms are the same. Different companies will offer a very different standard of virtual tools and support. In order to invest in the very best virtual home for your online learning courses and resources, it’s important to do your research about each piece of software and think carefully about how well it would meet the needs of your language school. In order to have the ability to easily and effectively teach live classes online, you will need to choose software that comes with a virtual classroom. There is a key difference between a learning management system (LMS) and a learning content management system (LCMS). An LMS is primarily designed to manage courses, whereas an LCMS does this and can also be used to design, develop and create course content. The language lab is an important part of language learning. 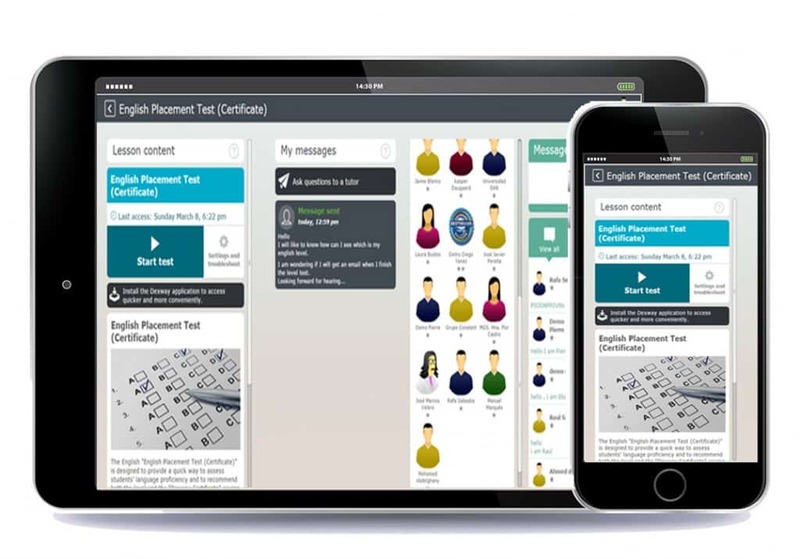 To give your students the best possible digital environment for this, you will want to choose an educational platform that offers language lab provision. The better you are able to see how your students are performing, the better you will be placed to meet their needs. Assessment is a very important part of running a course. Many educational platforms will be designed to manage a large part of the assessment process, making it easier and more time-efficient for your staff. In order to maintain your professionalism when delivering courses online, you’ll want to choose an educational platform that allows you to have full control of how the virtual learning environment looks. There is a wide variation on how much tech support educational platform providers offer with each product. If you’re researching online learning courses and resources and are struggling to find the ideal solution for your organisation, we’d love to help. Voluxion is our specialist learning management system (LMS) and learning content management system (LCMS) software designed with language schools in mind. You can find out all about what Voluxion could offer you here, or get in touch to book a free consultation.